When you can’t add any products to your store usually means there is an issue with your Amazon Key, Secret Key or Tracking id. Here you will see this screen below. Enter your Amazon Keys along with your Tag and select which Amazon Locale you’d like to advertise. Do you not yet have your Amazon keys? 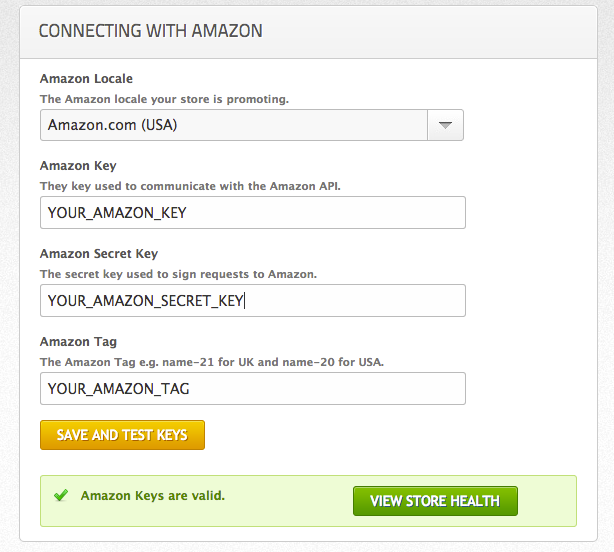 Please read this guide to getting your Amazon API Keys. Press ‘Save and Test Keys’ and wait a few moments. Are your keys giving an error? This error means that your keys are valid but they are being used too much. Amazon has an hourly limit on how much you can use the API. Once this limit is reached your keys will be temporarily blocked from accessing the API. This is not usually a problem and Fresh Store Builder will still work fine (it will retry regularly to get the information it needs). However, we recommend you look at other WordPress plugins and applications that use your Amazon Keys as they can be extremely inefficient. This means Amazon is not recognising your keys, please go back to your Amazon account and make sure your keys match letter for letter, with no extra characters, symbols are spaces at either end. If you have tried all of the above please contact the Helpdesk and we will do our best to help.